Permablitz (noun): An informal gathering involving a day on which a group of at least two people come together to achieve the following: create or add to edible gardens, share skills related to permaculture and sustainable living, build community, have fun. 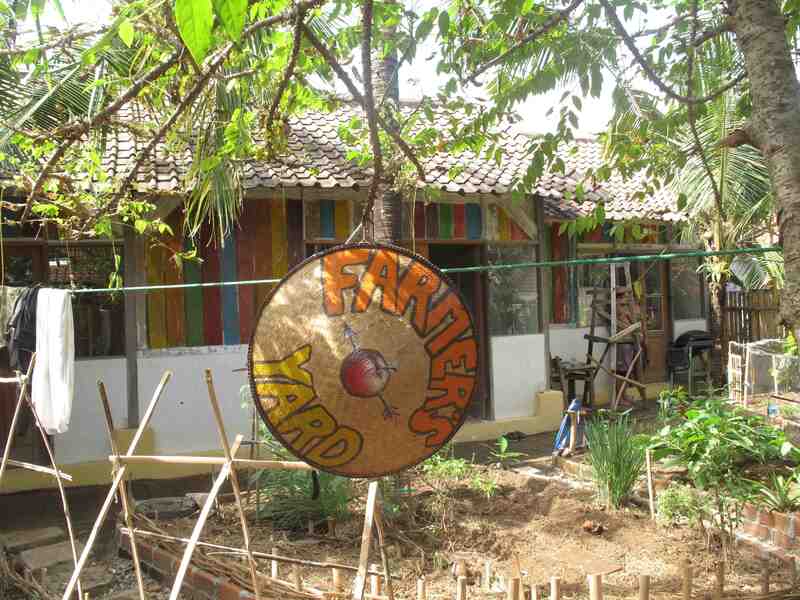 I arrive at the Farmer’s Yard, a permaculture garden, hostel and community space in Canggu, to find a group – made up of foreign travellers and Balinese – planting beans and cucumber in garden beds, and adding the finishing touches to a newly built chicken coop. With a concept of “Putting an end to careless tourism,” the space has been created on the principles of sustainable living, with the idea of connecting visitors to Bali with local neighbours and communities. The flourishing garden, filled with peppermint, eggplant, basil, cabbage and rosella was created during a permablitz, and I am here to meet Djuka Terenzi, who along with his friends, is the driving force behind Permablitz Bali. A direct action ‘green’ movement that sprouted in Australia and quickly spread across the world; permablitz combines ‘perma’ permaculture theory with ‘blitz’ a sudden, energetic, and concerted effort. Essentially day-long gatherings that combine volunteer labour and permaculture theory, a permablitz aims to transform an unproductive backyard garden or urban space into a productive or edible garden. The concept is simple, a permaculture designer draws up a site specific plan, volunteers provide the labour and the host makes lunch. As well as being a great way to get involved with your local community, joining a permablitz teaches you how to grow your own food at home using simple permaculture principles. The network runs on reciprocity so if you attend a few permablitzes, you then qualify for one yourself. Anybody can come, and everybody wins! The idea bloomed in the suburbs of Melbourne in 2006 when a permaculture designer, Dan Palmer, met a South American community group. Joining forces one Sunday, Palmer and his friends provided seedlings, compost, plants and ideas, and the community group provided labour, delicious food, music and dancing. By the end of the day a bland backyard garden had been transformed with a worm farm, pond, vegetable plants, herbs and chillis. The seeds of the permablitz movement had been sewn. The movement spread, by word of mouth, from Melbourne right across Australia and onto Hawaii, Istanbul, Montreal, Uganda and, of course Bali, with the first permablitz taking place at Sunrise School. The network has gone on to transform a number of gardens, including Terenzi’s own and that of the Farmer’s Yard Hostel. He explains that the free, day-long events are open to everyone and aim to create something ‘cool and efficient.’ A site is chosen, a plan made, a date is set and then the event is posted on their fb page. As well as making edible gardens, there may also be workshops on composting or water filtration, perhaps a little live music, and definitely a lot of laughter. Permaculture is essentially about mimicking nature – integrating people and places in ecologically harmonious systems that provide a good portion of the needs of people living there, with things like water, vegetables, fruit, and eggs. Of course prior to industrialisation, most gardens were based on permaculture principles, but intensive farming, consumer demand for cheap produce, and the growth of cities saw people shift away from a natural way of living. Permablitzes can reunite us with the land and are a great way for first time gardeners to learn some skills. “We are not just using energy, but creating it,” says Djuka. “Its about being super efficient, it’s about creating a self sustaining eco system.” Edible gardens help conserve energy by reducing the need for food transport; they also use less water than agricultural farms, encourage composting and are generally organic. Keen to see more permablitz sites, I also visit Kaleidoscope house, a riotously-coloured community house on the outskirts of Ubud, with yellow and green brick walls draped in psychedelic wall hangings. In the adjacent communal space a yoga class is under way, and another room at the back has bunk beds that house volunteers and visitors. Heading out back I find a nursery crammed with healthy seedlings, a garden bed edged in recycled roof tiles and sprouting with herbs, and tiny cherry tomatoes, and kankkung (water spinach) rising from a watery pot. 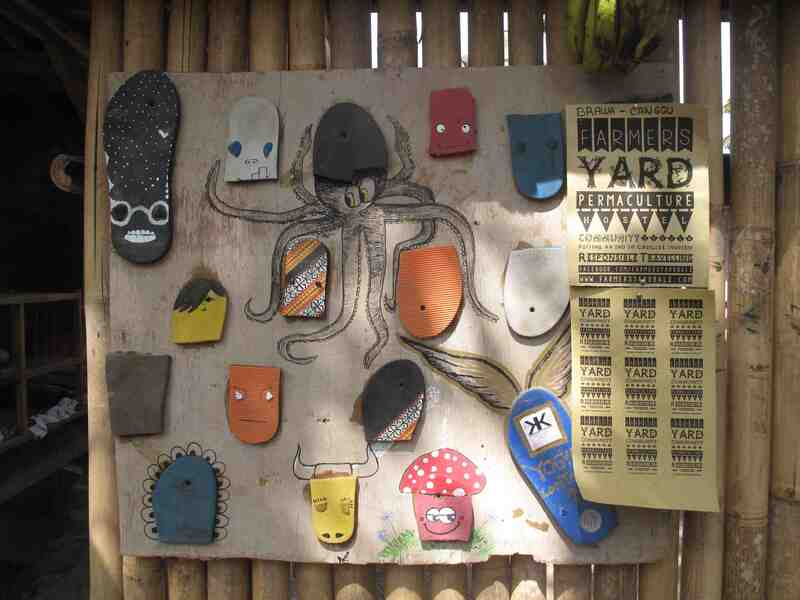 As well as being a Community House, Kaleidoscope serves as a base for Rumah Idea (Indonesian Development of Environmental Education and Agricultural Studies,) a Yayasan that works with local kids, teaching English, organic farming, bee keeping, chocolate-making, and dance. Back in the living room, sipping a delicious organic Balinese coffee infused with cardamom, cinnamon and cloves, my eyes rest on a sign on the wall, “Some want it to happen, Some wish it would happen, Others make it happen,” which pretty much sums up the Permablitz network.